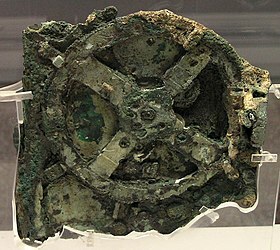 A British curator has recreated an ancient proto-computer, the Antikythera device, based on 2000 year-old salvaged parts, X-ray tomography and huge patience – and got it to work! As you can see in the NewScientist video, it was an example of a mechanical computer – designed to pr edict the relative positions of the planets, chart astrology and count down to the Olympics.It shows us just how advanced Greek science was, and makes us wonder – what would have happened if this technology had not been lost? Would the Greeks have been playing Spore in 200AD? – What makes this a computer? – What sets it apart from an old alarm clock? – Where do you think we would be now if this knowledge hadn’t been lost? Posted on December 13, 2008, in National Geographic, New Scientist and tagged ancient, antikythera, astrology, computer, discovery, greek, Michael Wright, museum. Bookmark the permalink. Leave a comment.